It's a busy time of year in the flower world. . .coming off the tails of Valentine's Day, we see Easter, Administrative Professional's Day (April 27th) and then the floral holiday to end all others, Mother's Day on May 8th. From now until then, we're also seeing a bevy of brides tying the knot before it simply gets too hot. . . and every single weekend from now until the first weekend in May, IT'S PROM SEASON!!! Colors for prom fashions this year run the gamut--nice neutrals, soft peaches and aquas as well as bright and bold turquoise and melon shades. Blue looks to be this year's color--royal blue, navy, turquoise and aqua are all popular. Another trend is neutral--champagne, taupe, silver or gold. Of course, tried and true black and white never go out of style--this season's white is not a bright pure hue but more of a romantic ivory shade. The hot style is the two-piece dress, which has a cute little sleeveless top paired with a long, layered, flowing matching skirt. Sequins and lace are being seen everywhere on the new prom styles for 2016. If your teenager is a guy, there are prom trends for him, as well. Straightforward black is--as always--very popular, with a traditional white shirt, black bow tie, black suit. Of course, if he and his date would like to 'co-ordinate' (new buzzword that replaces the dreaded 'matchy-matchy') his tie and cumberbund can be chosen in a color that goes with his date's dress. However, if black is boring to your teen, formal suits are showing up in greys, silvers and whites, with looser styling and a bit of sheen to the fabric. 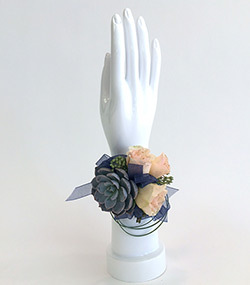 No matter what your teens wear to prom, Cactus Flower Florists can help co-ordinate the look with pretty, petite wrist corsages and single rose boutonniers all the wayto wild, blinged-out designs and everything in between. Check out our on trend prom collection!